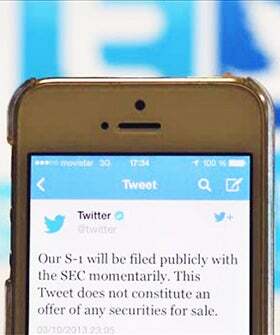 It's been six years in the making, but Twitter has finally decided to come out — as a public company, that is. Beginning Monday, investors will be able to purchase shares at $20 a pop ($3 more than expected). Woah! Three bucks, eh? That's cheaper than a tall skinny vanilla latte at Starbucks! It also means raising an estimated $1.3 billion, valuing the microblogging site at $12 million when all options and restricted stock numbers are accounted for. TWTR will officially be added to the New York Stock Exchange ticker November 7. Don't expect the share value to stay as low as it is now. Robert Peck of SunTrust Robinson Humphrey predicted that it will likely increase to $50 a share over the course of a year. "Based on the investor interest we’ve seen, I wouldn’t be surprised to see the price go up 20%," he told The New York Times . If investors' appetites prove to be insatiable, the share price will likely increase before the 6th, too.